Think Like An Amazon — MAD STRATEGIES Inc. It goes without saying that you need to please your customers and make them feel good in every interaction with your business. Unfortunately with more and more competition you need to keep upping your game. Although Amazon is a corporate beast it thinks ahead to consider the future market because it knows even their company might be shelved for a newer model. Amazon’s venture in forward thinking shopping includes their venture into the digital shopping cart app. Their new store concept Amazon Go is, in theory, an excellent one. The customer will not only have a fast, efficient, and easy shopping experience but he or she can browse and enjoy the experience knowing the checkout will be painless. Although the efficiency of the digital cart makes checking out faster it also improves the actual shopping time because the customer now doesn’t have to stress over long lines especially in large stores like their newly acquired Whole Foods Market where checkout in large cities can take 30 minutes or more. Amazon knows that once you expand your business the fun part of shopping and personalized customer service experience is replaced with a stressed-out race to the shortest line feeling. If you know your business will be too large to keep that boutique personal feel, you need to create a customer experience that will keep great service or not require it at all e.g. the digital cart. Amazon’s store might ditch customer service but it answers shoppers’ biggest need—quick checkout. In reality most shoppers, especially in big cities, don’t need or want any more human contact after a long day of work and commuting in throngs of people. They just want to buy their dinner or new laptop in peace…fast. Think about what your customers really want in their experience. Do you want someone asking if you need help when you buy jeans or groceries? No. Do you want immediate customer service when you shop for electronics or home appliances. Sure. Do you want a fast and easy checkout experience. Always. 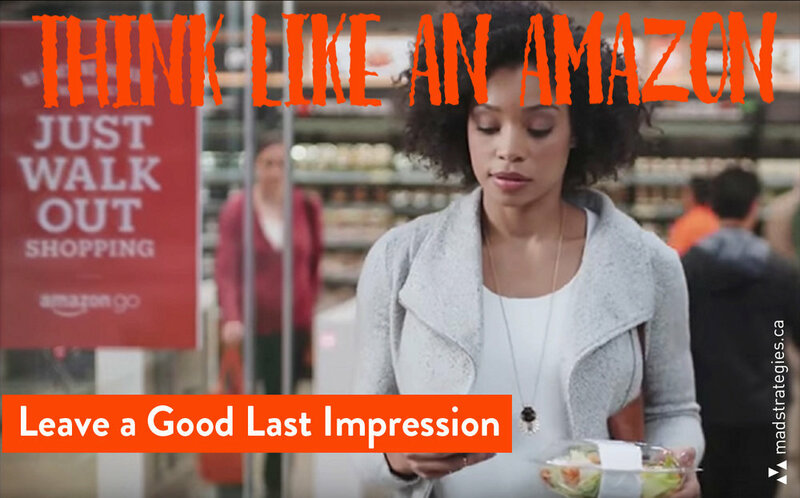 The last impression is really what your customer remembers. Make it a good one.